The fever is contagious. Gold fever, that is. "Today's the day," legendary treasure hunter Mel Fisher would say as he set out to sea each summer in search of the ocean's secrets. Before his death in 1998, he found more than $1 billion worth of treasure, including gold and silver bars, emeralds, coins and artifacts. As salvage season begins - roughly from May to August when the seas are calmer - a select few carry on Fisher's work up and down Florida's coasts, hoping to hit the mother lode. Similar salvage operations take place up and down the East Coast during the summer months, through the Carolinas, into Virginia and up through New England, where Revolutionary War-era shipwrecks have been discovered. 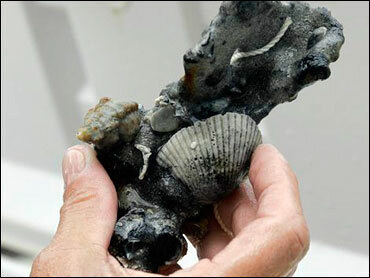 Florida is said to have more treasure-laden shipwrecks than any other state, largely because it is near the Gulf Stream. Spanish fleets would load their vessels with treasure from South America and gather the galleons in Havana. The ships would then head north, using the Gulf Stream to propel them back toward Europe. Fleets sunk in hurricanes in 1622 about 30 miles off Key West, in 1715 off Fort Pierce and in 1733 near Key Largo. Records indicate they carried hundreds of millions of dollars worth of treasure and artifacts, but the ocean has kept much of the booty a mystery for decades. A shiny piece of hope dangles from ship captain Doug Pope's neck. It's a Spanish silver dollar, known as a piece of eight, that was Pope's first treasure find in 20 years of scouring the ocean. "It keeps reminding me of what I'm looking for," Pope said on a recent sunny afternoon aboard his boat, the Polly-L. He and his crew were searching the waters off Fort Pierce for remnants of a ship believed to have been part of the 1715 fleet. "This is thought to be an untouched shipwreck. It could have $100 million on it. This spot, right here," Pope said. "The majority of the treasure from this fleet is still out there ... Today's the day. We wake up every morning and repeat that." Florida's waters hold promise for people like Pope. In 1985, Fisher found what was said to be the richest booty ever at the time - more than $400 million worth of gold and silver bars the size of bread loaves, coins and emeralds from the Spanish galleon Nuestra Senora de Atocha that sunk in 1622 off the Marquesas, about 30 miles west of Key West. But discovering treasure is no easy task. It takes days of monotonous searching and often a bit of luck. Using historical records, satellites, metal detectors and magnetometers, Pope and others follow virtual bread crumb trails made up of ballast stones, pottery shards, cannon balls and anchors. The treasures could be anywhere. Last year, W. Keith Webb's Blue Water Ventures found more than 16,000 pearls in a lead box, gold bars and other artifacts from one of the 1622 Spanish ships in the Keys. The find was worth about $12 million. Recently, Webb's crew found a tiny gold toothpick and earwax spoon - worth about $100,000 - near the same wreck site. "Finding this nice piece of jewelry on the most northern part of our search lets us know we're heading in the right direction," Webb said, adding that he's looking for up to $200 million worth of treasure. Captain Greg Bounds of Gold Hound LLC was aboard the boat when the pearls and other artifacts were discovered. "I'll never forget it," Bounds said. "I understand now exactly what gold fever means." Bounds is currently searching a wreck site from the 1715 fleet near Vero Beach. He says records indicate there's up to $900 million worth of coins from the fleet still out there, somewhere. "Maybe tomorrow we'll find a thousand gold coins. That's just the way it goes," Bounds said. While Spanish manifests detail cargo, there's no way to tell exactly how much treasure each vessel carried since many valuables were left off records to avoid taxes, said Ryan Wheeler, Florida's state archaeologist. "There was a lot of contraband," Wheeler said. All the hard work could also pay off with a big court dispute over ownership. Most known wrecks in Florida waters were worked out in the courts years ago, thanks to Fisher, but Spain could still attempt to claim ownership at any time, said James Goold, a Washington attorney who represents the country in such cases. "When we find a situation where it is necessary for Spain to intervene, we do so, and I think treasure hunters are pretty well aware of that," Goold said. Spain is currently waging a legal fight with Tampa-based Odyssey Marine Exploration over a shipwreck that yielded an estimated $500 million treasure, which could turn out to be the richest ever found. Odyssey claims the wreck was discovered in international waters, and that all the proper paperwork was filed to salvage the site. Still, Madrid argues the entire treasure belongs to Spain because it came from a sunken naval ship, and under the often confusing law of the sea, the country never abandoned it. Spain successfully fought salvagers who discovered two of its ships off Virginia's coast, where a federal appeals court in 2000 ordered that 100 coins and other artifacts be returned. The Spanish government eventually agreed to have the items displayed at a Virginia museum. Taffi Fisher-Abt caught the fever from her father. Along with her brothers, she now runs many of the Fisher family operations, including Pope's. He was subcontracted to work the 1715 site. She recalled her father's first valuable find in 1964 near Fort Pierce, a discovery that gave credence to the area's name - the Treasure Coast. "He said the bottom looked like it was paved with gold coins," Fisher-Abt said. "And that was it. He was hooked." Today, many of Fisher's finds are on display at the Mel Fisher Maritime Museum in Key West, the most visited museum in the state, with about 200,000 tourists a year. Back on the Polly-L, Pope's Amelia Research and Recovery crew scoured the ocean floor just a few hundred yards from shore. "Hang on guys!" yelled Pope to his crew as he maneuvered his 71-foot boat to the next X on the map. "Gotta wait for the swells." Once in position, the crew lowers an 8,000-pound set of fan blades the size of tractor tires into the water with a crane. The twin propellers whir like a muffled jet engine, blowing a hole about 15 feet deep into the soggy sand on the ocean floor, turning the clear water into a hazy cloud. When it settles, divers jump in with metal detectors and sweep the freshly cleared area, hoping for a sparkling gold reminder of why they do this. "We're all born with the desire to find treasure," Pope said. "Some people just follow that dream. Some don't."